The hackathon is no longer new or novel. On any given weekend you’ll find a collection of coders hunched over their laptops, with a seemingly endless supply of pizza, energy drinks and a little vitamin D deficiency as well. However Vancouver hosted it’s first AngelHack AppHack event. 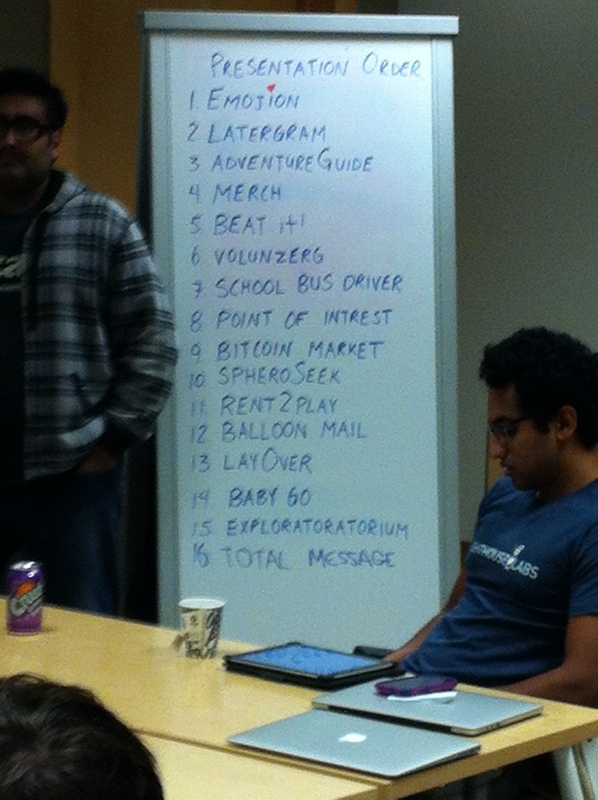 The event at large is supposedly the largest Mobile App Hackathon ever. Over 30 cities and 6,000 developers joined in to be part of building a stronger developer ecosystem around the world. Depesh Parmar, cofounder of Picatic (and a great team of volunteers, sponsors, and judges) is a big reason the Vancouver event came together. 70 people registered and another 70 people wished they could’ve attended. The call out was specifically for anyone wanting to build a mobile application in HTML5, on iOS, Android, or even Appcelerator’s Titanium. It was a mobile-first event and people were free to connect an app to wearables, in-car devices, and other hardware integrations that were formed. With SAP opening their doors, sixteen teams ended up working tirelessly for 24 hours to earn an opportunity to win acceptance into the Spring 2014 HACKcelerator program. HACKcelerator is a global pre-accelerator program designed to help top hackathon teams turn their hacks into market ready products. The winning AppHACK team received full support for whatever product they need help developing. It’s also a platform for connecting with mentors and a series of events in Silicon Valley to network with investors and media. It was impressive seeing 15 of the 16 teams sharing a two minute live demo, with some really intriguing and interesting ideas being explored. Judging wasn’t easy. Ultimately, experience and a market ready idea ruled the day with Latergram, taking home top honors. Created by members of two local startups MapDash (Roger Patterson & Ian MacKinnon)and Thinkific (Matt Smith and Cindy Chen), Latergram allows you to schedule and optimize your Instagram posts for later. An interesting side note is the fact that all three are also connected through working at Launch Academy. It’s worth asking, is it coincidence or correlation to see success coming out of a creative hub? It’s cliche, but fair to suggest that everyone who participated was a winner. Parmar did confirm that plans to host Vancouver’s second AngelHack event for the Spring of 2014 will be in motion soon.